So i ended up with a 40D, and the MPE 65mm as well as the mt24 ex flash. Quite a bit of camera for a newbie, but im ready for the challenge. Today i tried the stacking technique that your thread describes. 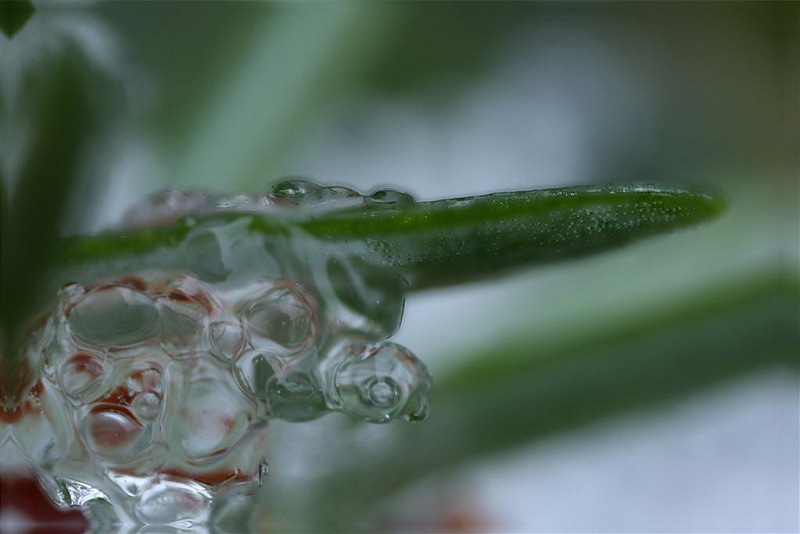 It rained pretty hard today here so i wasnt able to go outside and realy shoot much, but i was able to get these shots of some ice crystals melting on top of pine needles. I know they aren't the best shots, but i am happy with the stacking attempt at opening up the depth of field. I also cloned the final shot as i am building up quite a bit of sensor dust. I have a kit on the way but until it gets here im not sure how i can realy clean it. anyway here are the photos that i took today, and stacked. Three shots and then the fourth is my stack. this is the three images stacked thru combinez. I also cloned out the sensor dust shadows that were in the image in cs3. There is some dark haloing in the final image which you would need to clone out - this often happens along highish contrast edges. Hey great effort there Nano, your learning from the Best "Brian"
Hey thanks for the kind words guys. i am definilty eager to learn these methods. They are awesome, and im realy interested in putting them to work in my essential oil secreting gland shots. ANyway brian, i was wondering if you have any particular methods for cloning out that dark haloing? Is there a stacking program on the Mac? Hi nano you can either try to use the clone tool as you suggest or a method I frequently use, is to use the healing brush tool to copy the affected part back from one of the original pics onto the stacked pic. Obviously you have to find the correct original with that part of the subject in focus. Hey everyone, I've been lurking for a while now, while I saved up the money for a camera...now I've got a Nikon D80 with a Sigma 105mm f2.8 EX DG, and an SB-600 for a flash. Got home today and found our beta had jumped out of his bowl while we were out, and well, I had to use him to practice focus stacking, only had the camera for 6 days now, so expect to see more of me. Did a little post-proccessing, like cropping out some blur, but nothing major. Wow well done Ahzdeeen, you managed to bring back heaps of detail with your stacking. The comparison shots really speak for themselves. Thanks! I cant wait to try out this technique! Not necessary to shoot RAW for any pics but I just find the exposure latitude useful for macro shooting even if I'm focus stacking. As far as it not working, it does sound as if the shots have too much movement between them. I don't use a tripod for mine, but often I'm resting the lens on the same surface as the bug which helps keep the POV constant. Is the program you recommended in this thread still what you would recommend? Brian, thanks for a great tutorial - I work with your son and he gave me the link to them. Tried this out over the weekend with some coins and got some good results. It'll certainly help with my photography evening class project on details in nature - I'm getting a lot of inspiration from your fantastic images. Just got to find a willing subject to do something 'real-life' now like your insects. Hi Chris- Yes Robert mentioned you were getting interested in macro - amazing coincidence! I SECOND the motion--I mean, I heartily support Andy's kind request here! May we have your permission to have this live permanently on our Tutes site at http://dgrin.smugmug.com ? Losing a bit from the edge of the frame is inevitable. As you move closer to the subject to change your focal point you'll lose edge of the frame you had in the first shot. You can minimize it with a steady hand but you'll still need some cropping with even a perfectly aligned set of shots. The only time I've been able to avoid crop is with a solid color background that meats all the sides of the frame. In ever stack with 3 or more frames ive done, every thing seems like its off...like the edges of things inside the picture are doubles, or tripled, etc. Is there something im missing maybe?? Hi - yes they are what I call halos - you tend to get them on high contrast edges. Whilst they can be reduced by better alignment when taking and processing the stack I often still get them in my stacks. You either have to manually clone the halos out or you can use the healing brush tool in PS to paint the same in focus part from the original stack slice onto the stacked picture. OK, I will try that. I havnt done a lot of cloning or healing, but I will experiment. Is there a way to improve processing the stack? Like when you choose the points or something? it just takes practise to get the frames better aligned when taking them. czp aligns alot better than older version czm by the way. you can also take a frame with good sharp outline and use layer mask to show good edge through over stacked image, easyer than clone ing sometimes. Like Brian said you end up with these on occasion and you need to clone them out. I have been getting decent results using auto align. I did download the newer CombineZP software and there is a stacking macro called "Pyramid Stack" which seems to do a better job with halos than the other methods. For me it just seems to be a bit of a crap shoot when these halos come up. I've had a couple shots aligned very well off tripod but needed a lot of work after stacking. Then again I've had bad hand held shots where the subject even moved and had to do very little touch up work. I have noticed deeper stacks seem to be a bit more prone to halos. For some reason I just cant get a decent stack. Ive tried dozens of times, and with different sets. I downloaded combinezp, and even tried the pyramid stack, and still get these results. I am doing it in manual mode the way that is described at the beginning of this thread...Id appreciate any help. and the images were shot on a tripod..
Heres another example...this is a little more obvious. This one was on auto.